“Mr. Sauer parroted baseless talking points that have their origin in fossil-fuel industry-funded climate change denial propaganda, not honest scientific discourse. Then the article - Professor Mann was writing about a hit piece from someone called Norm Sauer, who wrongly accused Dr Mann of fraud and fakery and more. (If you must read it, follow the link from Michael Mann's article above.) It was, as Michael Mann said, nothing but baseless talking points, a parroting of the worst denier memes about. I don't think there was an accurate sentence in among the entire opinion piece. And it was so yesterday. So old hat. And Michael Mann was right to respond. Anthony is way wrong. 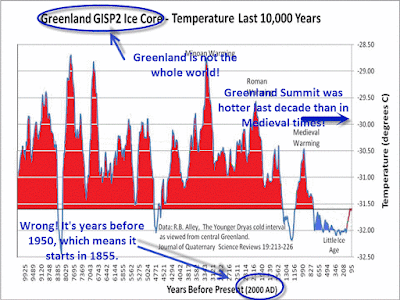 The ice core proxy temperature chart that he put up shows that Michael Mann is right and Anthony is wrong. 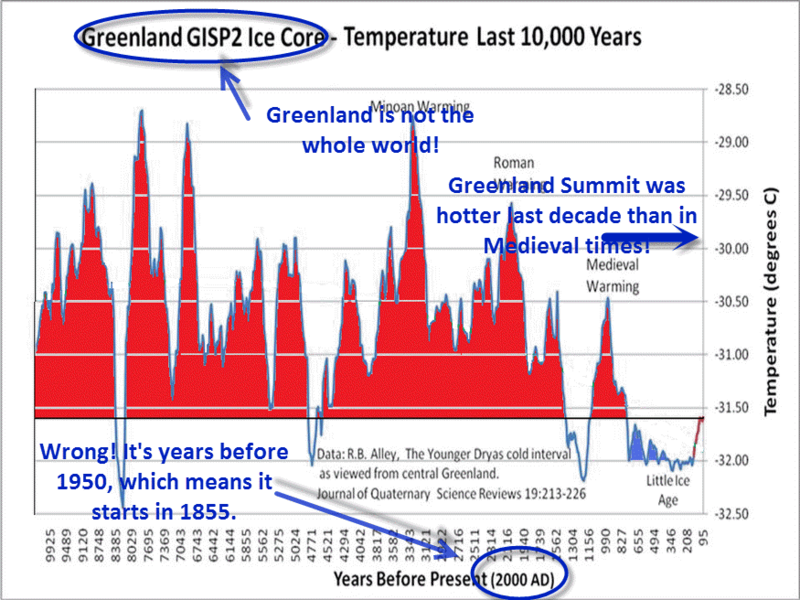 The temperature on the top of the ice sheet in Central Greenland is higher today than it was in Medieval times. First of all, Greenland is not the whole world. Anthony is wrong about that. So his chart cannot prove Anthony's "otherwise". Secondly, his chart starts in 1855, so it doesn't show the present. Meaning it cannot prove Anthony's "otherwise". Thirdly, I've added the average temperature for the decade ending in 2010. It's probably even higher today. So even if the chart is corrected, it disproves Anthony's "otherwise". I think Anthony is going ga-ga. The heat is addling his brain. He is behaving like one of the more extreme deniers at WUWT. It's not as if he doesn't know the chart he used is wrong. It's not as if he doesn't know that Greenland isn't the whole world. Yes, that's right. On Anthony's own website he's got his supposed good chart listed not just as disputed, not just as falsified [corrected label, Sou], but it has acknowledged that the labelling is wrong! The Medieval Warm Period was 11,500 years ago? It gets worse, if possible. Apparently a reader quizzed him on the chart. So Anthony posted a big slab of quite irrelevant information. He added something about The Younger Dryas cold interval, that there were "Near-simultaneous changes in ice-core paleoclimatic indicators of local, regional, and more-widespread climate conditions demonstrate that much of the Earth experienced abrupt climate changes synchronous with Greenland within thirty years or less." Recent estimates of the age of the Younger Dryas termination, including those of Hughen et al. (1998) and Gulliksen et al. (1998), and those summarized by Alley et al. (1997b), indicate an age close to 11,500 yr before 1950. In fact, it's off the chart. It's not even shown on his chart - it's way off to the left hand side. If Anthony ever had any sensible readers, they've been leaving him in droves. Have a gander at the comments. Anthony deserves them. Mann appears hell-bent on making himself a laughingstock, with or without the help of Mark Steyn. J. Philip Peterson wants to know how to estimate temperature from ice cores. Well I don't have time to educate him today. I've written about this sometime or other. 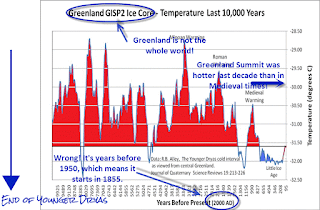 Once again, how can you measure temperature for 800 years, 1000 years, 3000 years from an ice core? As a layman, I don’t understand. The Vikings didn’t have thermometers…please explain how it is done from an ice core? 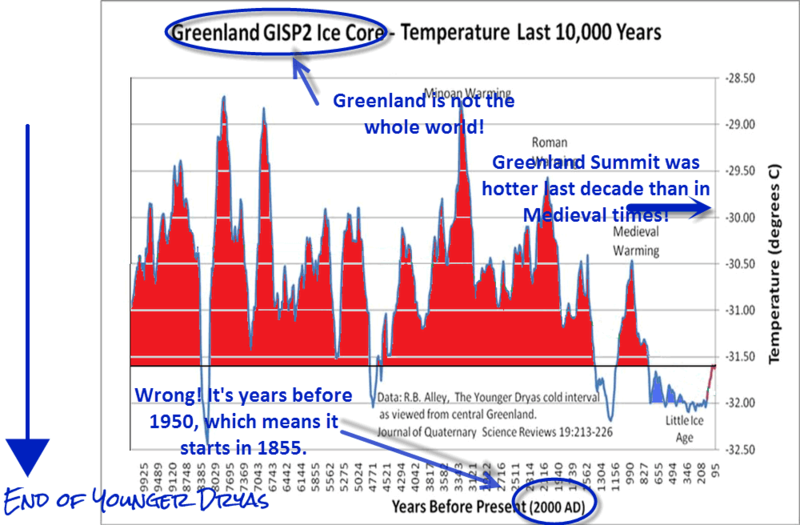 The graph shown is not a refutation of Mann’s words, since firstly it concerns local temperatures rather than overall temperatures, but more importantly, it ends at 95 years before present, which would either be 1905 or 1855 depending on who you believe. Either way, it is not valid as an argument in a discussion about temperatures today. M Courtney doesn't believe you can compare past temperatures to present temperatures. I mean literally. He thinks it's not permitted. Is he for real? Nor would splicing current temperature records onto a proxy be valid as an argument in a discussion about the MWP. You’re right that that would be like Mann’s Nature trick. But it’s not a legitimate technique that would be used by honest or competent scientists. Anthony Watts doubles down on his mistakes, and swears that the caption is correct. It's not and he knows it's not. He's been told lots and lots of times at WUWT that the "present" is 1950, as is convention. Note the caption, it is to the year 2000, the scale is not indicating an endpoint at 95. Note also that the data and graph is from Richard B. Alley, of Penn State, a colleague of Mann. And then he posts his slab about temperatures of 11,500 years ago, as if they've got anything to do with temperatures of 1,000 years ago! But BP means before 1950. Anthony then put up a dinky chart of unknown provenance, which no doubt displeased M Courtney, because someone had spliced what they claimed were current temperatures on GISP2, but weren't. It stopped at minus 31°C, whereas Kobashi et al (2011) reports the temperature of the decade to 2010 as "The current decadal average surface temperature (2001–2010) at the GISP2 site is −29.9°C", which is considerably warmer than it was in medieval times. So Anthony fails again. Yep, I suggested that Mann should add Tony as a codefendent in his lawsuit. Thanks, Gareth. That's an excellent article. I've added a link to it up above now. One might wonder why Tony doesn't show any global reconstruction, like the PAGES 2K one from two years ago. And that applies to many other "skeptics" as well: why do they always show data for only the Central Greenland summit, and not the globe? It is a mystery. The same incomprehensible mystery may explain why they like to show temperature estimates for the upper tropical troposphere and pretend it is the global surface temperature. Cherry-picking, pure and simple. Showing the global temperature does not fit their narrative, so they ignore it. I have pointed out the fallacy of that graphic many times on WUWT with response by the moderators, they even explained my position. I linked the source data with reference to the definition of "BP". To continue to reuse this graphic is nothing short of gross deception and should bring into focus the abhorrent, sociopathic nature of these climate denialist portals, with their >$100 million dollars of funding from fossil fuel suppliers over the last decade. Their wont is to make money, plain and simple, they have NO regard for the poor, the sick and those who will suffer early mortality due to resource wars, heat waves, illness and extreme weather impacts over the coming decades. Ah, but you obviously didn't get the memo. Nowadays the meme is that the poor will never rise out of poverty without that wonderful fossil fuel energy -- cheap, abundant, and it makes plant food too! Of course, most of these folks never gave two hoots about the poor of the world, until they could be used as pawns in their argument. Yep. I've always found this line pretty funny, but they've been using it for a decade or so. I first saw Christy use it in Congressional testimony during the episodes which led to the Wegman report being commissioned. There is nothing new with these guys, it's all recycled. The libtards said that the poor, the sick and the vulnerable would suffer most. You do not have to pay social Darwinists to be against that; they love it. They would gladly pay money and are willing to make America suffer to make that social Darwinian paradise happen. Since the ice core doesn't start until 1855 (because the top good few metres of any ice sheet is 'firn', uncompacted snow/melt which hasn't formed part of the ice core yet), what proxy data does M Courtney propose we use? Same with ocean and lake sediments. The top hasn't settled yet. That's why we have to use the temperature record. What is curious is that the maker had grafted the 'hockey stick' onto it without realizing that the last datapoint still was 10pxl or 80 years from the year 2000. For the global Holocene, you need Marcott et al. (2013) Fig. 1 b (some added text). The contrarians raised an almighty howl over that study, IIRC ;-) (How many posts at WUWT and CA was it again, Sou? I remember you keeping tally but I lost count eventually). The trouble was, despite all the frenzied denial and misrepresentation, there was nothing wrong with M13, was there? Watts has referred to this post now and its graph, still acting as if he doesn't know how misleading it is. And he has added more evidence: proxy data from the Pyrenees! Anthony is really scared of Michael Mann, which is why he has it in for him. Remember when Anthony got his WUWT fans to pay for him to go all the way from California to the UK, just so he could ask Dr Mann some questions. Then he piked and didn't even put up his hand. When he finally got back home and was safely behind his computer, he posted something stupid on Mike's facebook page. That was just so he could tell his fans that Michael Mann refused to answer the questions he didn't ask. This time he is claiming that it's Michael Mann using invective, when it's the person Michael is responding to who accused Prof Mann of fraud and fakery. Anthony is bad most of the time but he's worse than bad when he attacks scientists. "The Spanish Pyrenees δ13C based reconstruction presented here shows warmer and more variable growing season temperatures during the Little Ice Age than previously described"
It must be that Watts has never heard of PAGES 2K, the largest effort ever to reconstruct global, hemispheric and continental-scale temperatures for the last 2000 years. I mean, give the man a break: we can hardly expect a simple blogger who is so focused on hockey-stick-shaped reconstructions from the late 1990s to have any kind of awareness of what has happened in the field during the last 10-15 years.